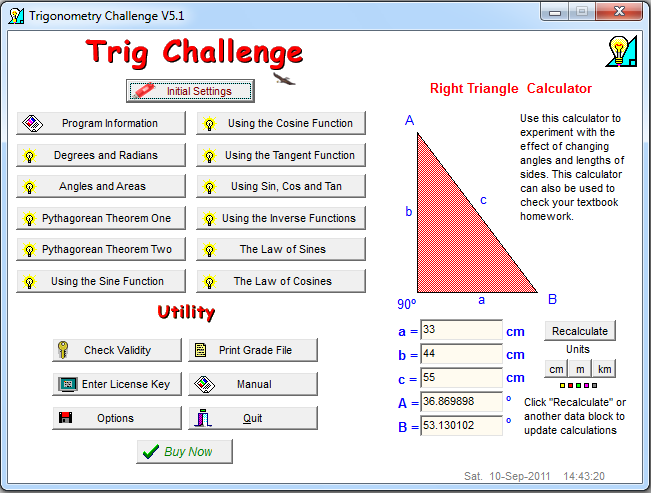 Trigonometry Challenge is designed to help students learn to do calculations related to right triangles and sine waves. Solutions to oblique triangles using the Law of Sines and the Law of Cosines are includes. This program is also useful to teach trigonometric concepts required in the study of AC circuit analysis. 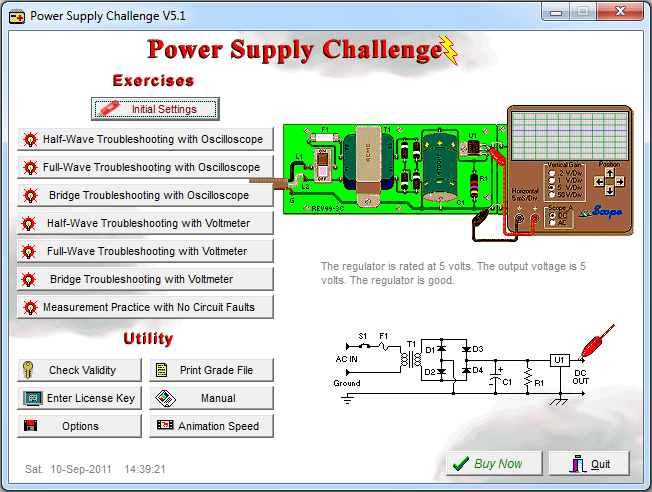 This program provides realistic troubleshooting activities of almost unlimited variety on DC Power Supplies. Students practice troubleshooting half-wave, full-wave, and bridge type power supply circuits using a voltmeter or oscilloscope. Student responses are scored and corrected immediately. Grades can be recorded on disks or printed on a certificate. 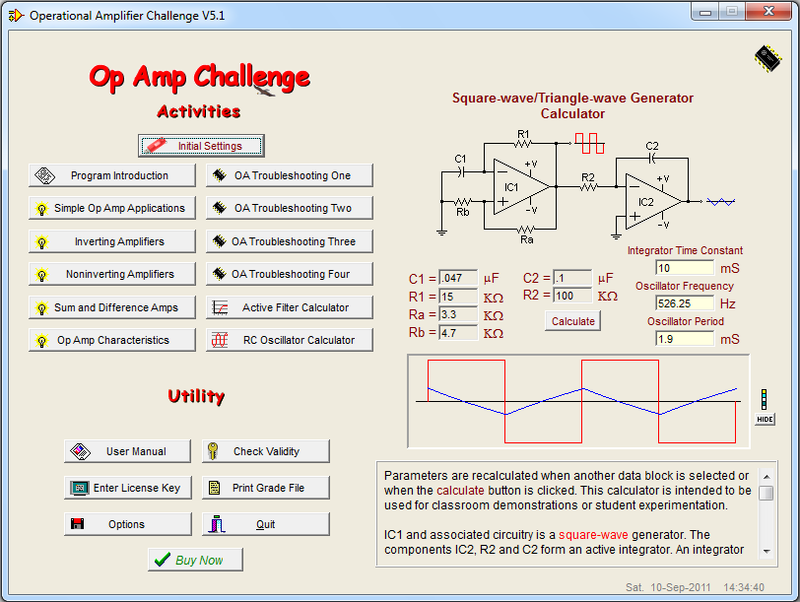 Op Amp Challenge is designed to supplement your classroom and textbook instruction on operational amplifiers. The program includes activities related to followers, comparators, I to V converters, inverting amplifiers, non-inverting amplifiers, summing amplifiers, difference amplifiers, operational amplifier characteristics, troubleshooting, instrumentation amplifiers, RC oscillators and active filters. 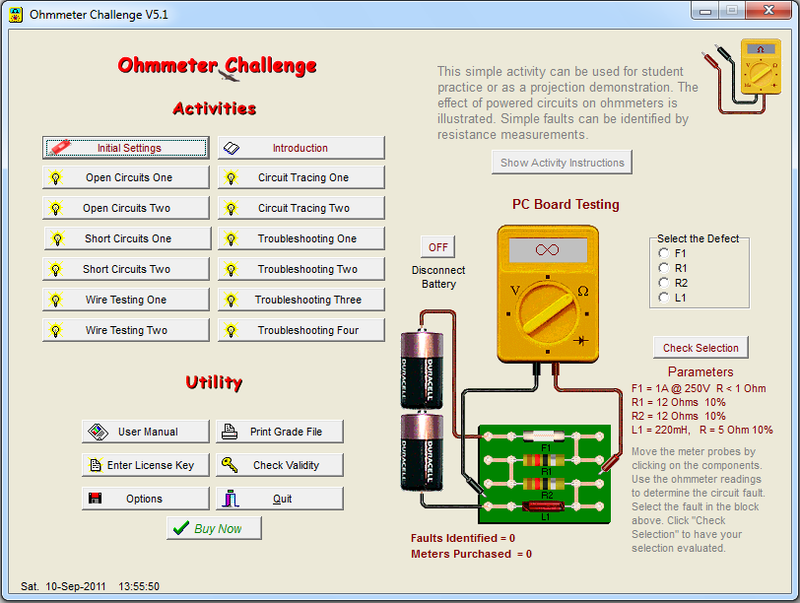 Ohmmeter Challenge is designed to help you teach students to analyze wiring and troubleshoot circuits using digital ohmmeters. Activities teach students to find shorted and open circuits in wiring. Troubleshooting circuits consisting of wiring, resistors, lamps, relays, coils, diodes, switches and PC boards are included. Each activity consists of randomly selected parameters and components. Digital Challenge is a set of interactive activities for use in teaching basic digital concepts. The activities give students immediate feedback to reinforce correct responses. All student responses are corrected and graded by the program. 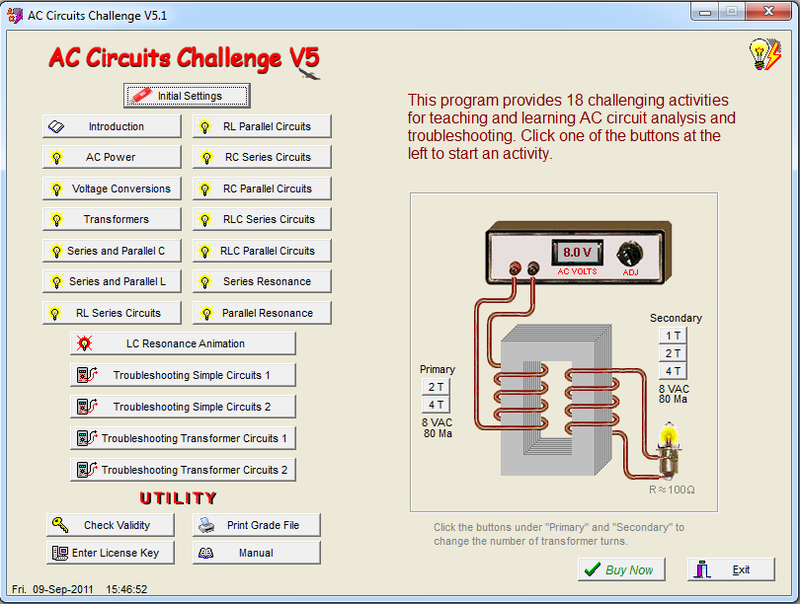 AC Circuits Challenge V5 consists of a set of fourteen activities to assist instruction of AC circuit analysis and troubleshooting. 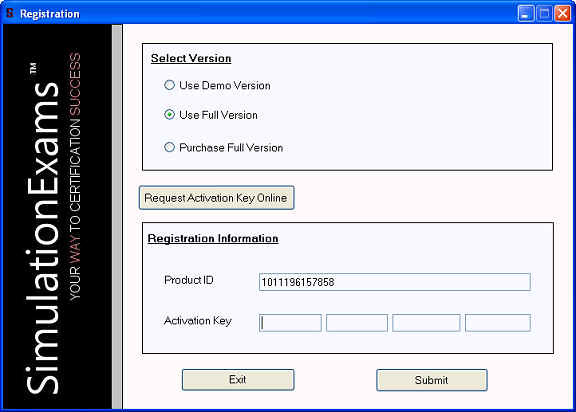 Each use of an activity has new component values and parameters assigned. Student responses are scored and corrected immediately. 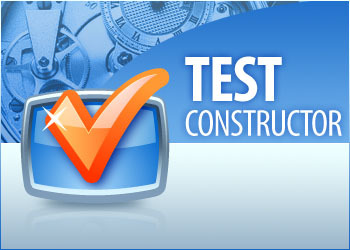 Realistic visual troubleshooting activities are included in this program. 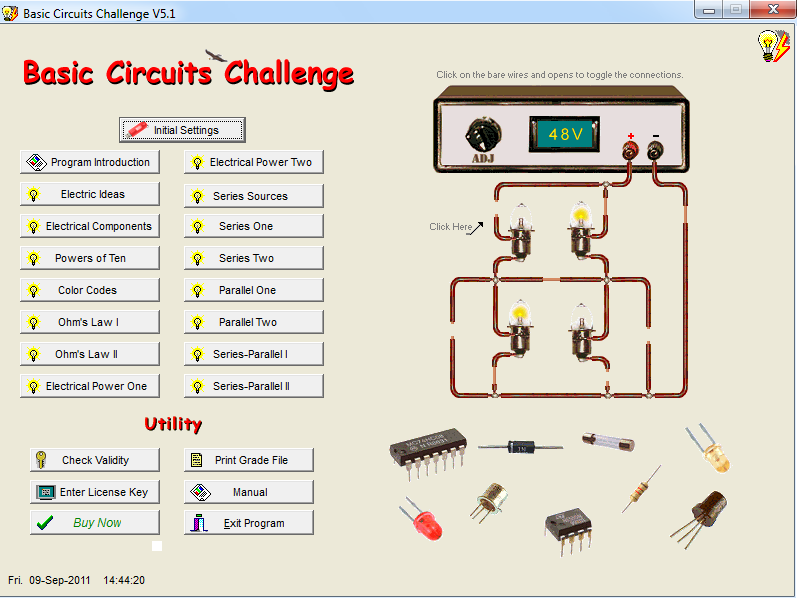 Basic Circuits Challenge consists of a set of fifteen activities to help you teach basic electrical concepts. Exercise Titles: Electric Ideas, Electrical Components, Powers of Ten, Color Codes, Ohm?s Law One, Ohm?s Law Two, Power One, Power Two, Series Voltage Sources, Series Circuits One, Series Circuits Two, Parallel Circuits One, Parallel Circuits Two, Series Parallel Circuits One and Series Parallel Circuits Two. 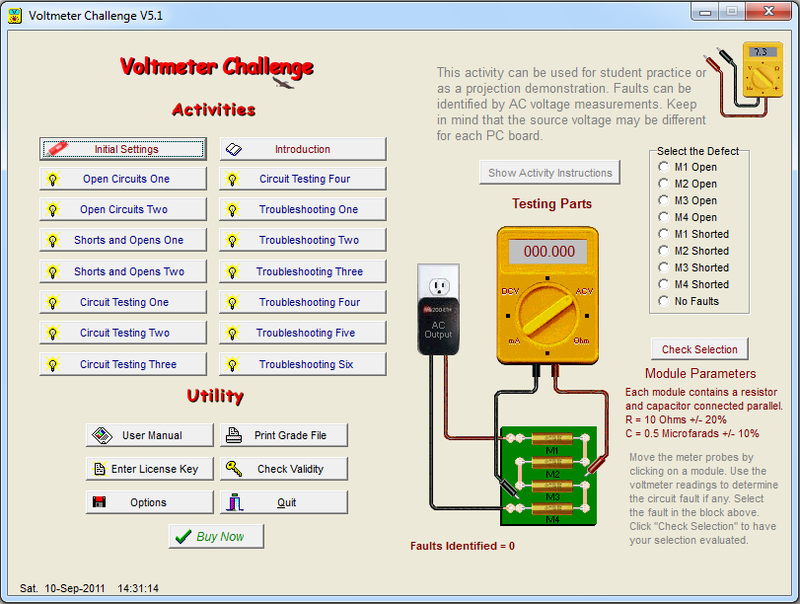 Voltmeter Challenge is designed to help you teach students to analyze wiring and troubleshoot circuits using digital voltmeters. Troubleshooting circuits consists of wiring, resistors, lamps, relays, coils, diodes, switches and PC boards. Activities have context sensitive help to provide formulas and procedures when required. Realistic visual troubleshooting activities are included in this program. Number Systems - Number Conversion - Number Types - Compound Measures Roots - Angles and Parallels - Triangle Ratios - Triangle Angles - Percentages - Ratios - Fractions - Vectors - Circle Angles - Laws - Algebra 0. - Algebra 1. - Algebra 2. - Mathematical Rules - Powers and Indices - Geometry - Simplifying - Equations - Graphing - Slope and Translation - Curves and Angle Conversion - Personal Finance - Data Analysis - Binary Numbers - Binary Arithmetic.